Irrational Games doesn't have much to say about multiplayer at the moment, so don't be surprised if BioShock Infinite lacks deathmatch. With BioShock Infinite announced to the world just last week, gamers are still wondering exactly what the game will include. New plasmids? Better A.I.? Incredible new environments? Yes, most likely, but one thing that probably won't be in the game is a multiplayer mode. That is, unless Ken Levine and the rest of his Irrational Games team come up with one that works. However, according to Levine, Irrational only wants to design games with features that make sense, not ones that are tacked on because the industry mandates they should be. As for now, Levine told Kotaku: "We have not made any determinations about multiplayer." He continued: "I will say that we experiment with things, but for us we are never interested in making a multiplayer mode you could just play in some other game. Because, A) that's not creatively interesting and B), financially, you're wasting your time. They're going to go play Halo. They're going to go play Call of Duty." Levine's game design philosophy seems to revolve around finding something new to show people or the exploration of a unique gameplay aspect. He says Irrational would do a multiplayer mode for Infinite: "If we do something new - if we do something like Left 4 Dead that has something new to say." Without that basis, he doesn't think developers should waste their time. Of course it's hard to agree with the idea that a multiplayer mode should be forcefully shoved into anything. The way Irrational tells it, multiplayer just doesn't seem to fit into BioShock's goals. 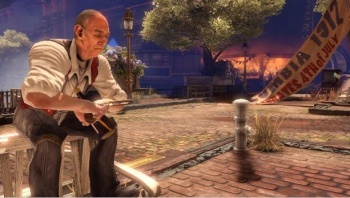 The rub is that BioShock Infinite's setting is just so cool, it'd be great to see something multiplayer oriented that uses it with the direction of "saying something new," but Irrational appears to be fine leaving multiplayer to other studios.